TerraSystems is a geotechnical contracting firm specializing in dynamic compaction, rammed aggregate columns, wick drains, and various vibro systems for improving poor soil conditions. Our senior management personnel have been in the ground improvement field since the early 80’s and have completed nearly 1,000 projects. Our staff also has a strong consulting background, enabling a better understanding of geotechnical problems and their solutions. The successful application of a ground improvement technique is highly dependent on the experience level of the personnel designing and performing the work. We pride ourselves on being second to none in this category. TerraSystems maintains in-house equipment for geotechnical contracting, including specially-modified cranes, large-diamater auger drill rigs, dynamic compaction tampers, electric and hydraulic vibrators, and wick installation stitchers. Our goal is to provide a professional geotechnical contracting service at a reasonable cost. 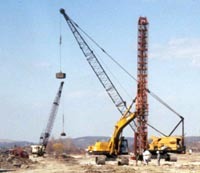 We do not strive to be the largest geotechnical contractor, but rather to provide the best service. Most of our clients are repeat clients. In addition, most of our work is by referrals from geotechnical engineers with whom we have developed a working relationship over the years. Discovery's Daily Planet featured Dynamic Compaction work that we performed at the Fort Lauderdale-Hollywood International Airport. Our goal was to collapse potential sinkholes for a runway expansion by using large tampers dropped from sufficiently large heights.